Oceanside view of condo. Community beach access. 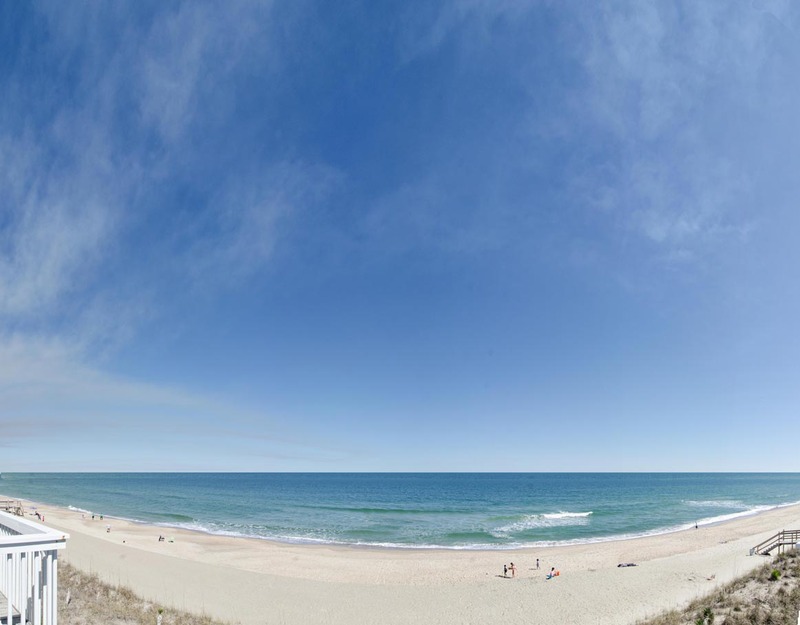 Panoramic ocean views await you in the popular Ocean Dunes community of Kure Beach. This 2-story, 2-bedroom, 2.5 bath oceanfront townhouse is perfect for that family of 4 vacation. The kitchen, living with sleeper sofa and dining areas are on the first floor. 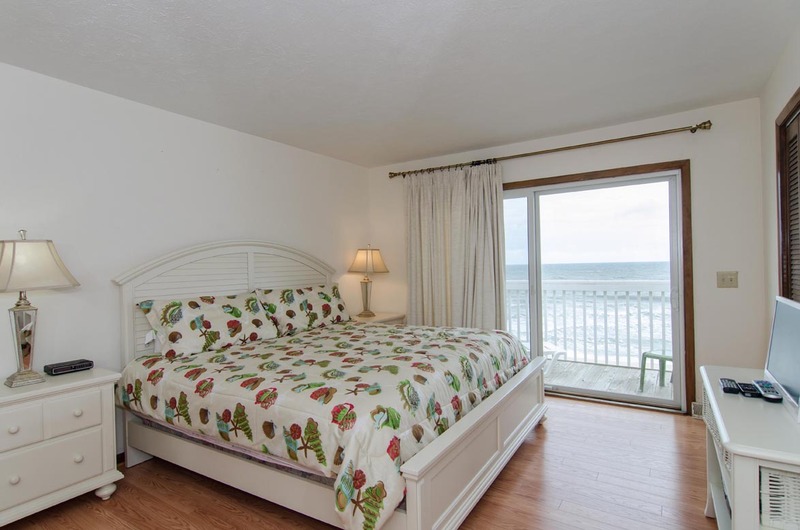 The oceanfront master bedroom with king bed and street-side guest bedroom with 2 twin beds are on the second floor. 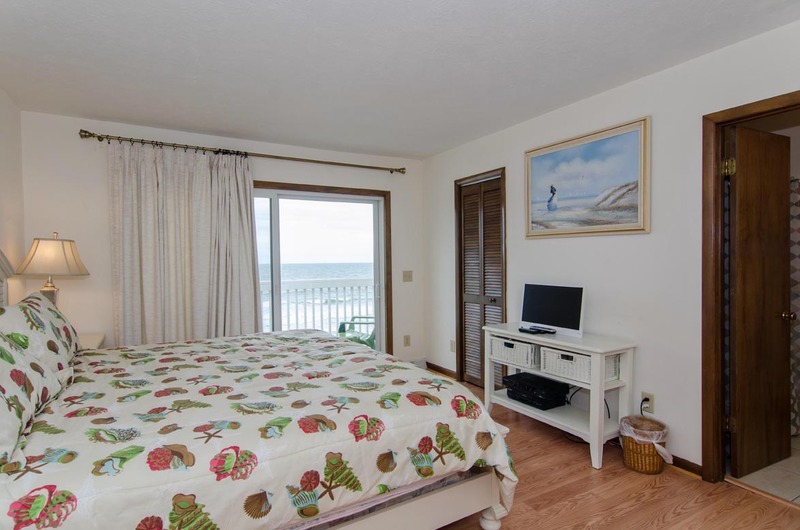 There are two oceanfront decks; one off of the living room and the other off of the master bedroom. Covered deck on lower level for outdoor dining and relaxing or soak up the rays on the upper level. This is a non-smoking unit. No pets. The townhouse was clean. The view was beautiful. There are maintenance issues that need addressed though. The cable is worthless. There are very few channels actually subscribed to. The WiFi was very spotty too. I had to reset the router almost every day. The TVs are very dated too. There are outlets in the kitchen that are corroded and don’t work. Had to move the microwave after troubleshooting the issue. 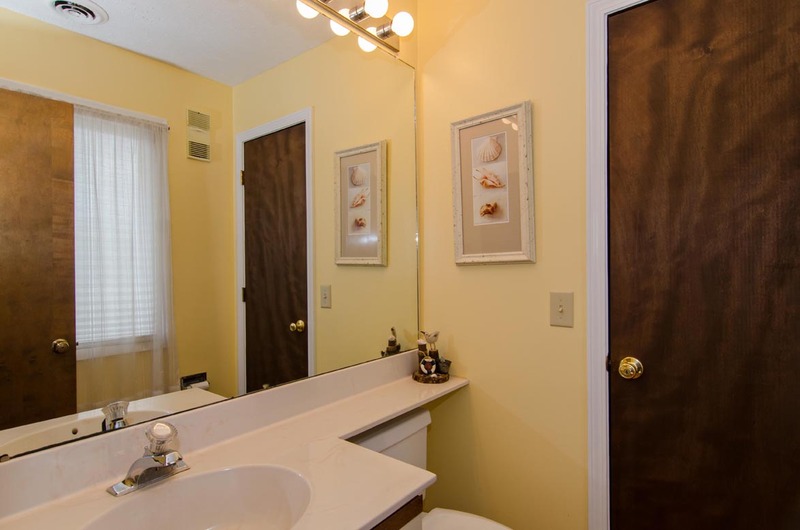 The downstairs bathroom toilet seat does not remain up. Sliding glass door locks are corroded and difficult to latch. A lamp in the master bedroom did not work. Lastly, a maintenance man keyed into the home without knocking. My girlfriend was standing there in her bra. Lack of maintenance and updates required do not justify the rental price. I recommend looking elsewhere. Sam we appreciate your feedback on the property and we will relay your thoughts to the owner. We do not have any record of any service orders for this unit during your stay, so I am confused to who entered your condo. We hope that you had a nice vacation and that you will consider Bryant real Estate for your next vacation needs. We enjoyed our stay at Ocean Downs - our townhouse was in a great location and was in good condition. Overall a really great place. It's a bit disappointing that that they haven't updated the TV (it's a massive $150 for a 32" flat-panel which would fit inside the existing spot). I also think some slightly better patio furnature would make a huge difference. That said, the view was great, it was clean and well maintained, and the beach access was great. The Good: Amazing view from the mater and from the living area!!!! Indoor furniture was comfortable, AC worked well, close to private beach access, covered parking. The Bad: Living Area TV is horrible, Some deck furniture needs replacing, Fridge broke while we were there. Hi Thomas- thank you for your feedback! We are so glad to hear that you enjoyed your stay! We would be happy to pass your comments along to the appropriate parties. Thanks again- we hope you have a wonderful summer! The Townhouse at Ocean Dunes is in a quiet family oriented section of Kure Beach, and close to the great restaurants and nightlife of Carolina Beach (5 min) and Wilmington NC (30 minutes). There are all sort of of activities in the area: Aquarium, civil War sites, state parks (with venus fly traps growing naturally), arcades, escape rooms, boat tours, fishing piers, off-road 4x4 roads, etc. The complex has two outdoor pools and a really nice indoor pool. The condo itself has an incredible view of the ocean from both balconies. We enjoyed our stay at Kure Beach. The townhouse could use a little updating including patio furniture. Hi Maureen- thank you for your feedback! We are glad to hear that you enjoyed your stay. We would be happy to pass your comments along to the owners. Thanks again- have a wonderful summer! Very nice place to stay and Bryant Realty has a great staff to help with anything during your stay.I definitely would rent this property again. The property was nice. I would have enjoyed a washing machine that actually held a load of towels. We had to wash 2 loads of towels a day just to keep bath towels clean. The dryer filter was broken and it took several days to get that fixed. Our trash cans were taken to be cleaned by the HOA. We finally got them back on Friday but I had to choose between keeping trash in the room or putting it out and hoping an animal didn't break the bag open. Overall it was a good vacation but I didn't like having to deal with day to day problems. Kind of felt like being at home. You go on vacation to get away from all of that. It was a relaxing and enjoyable 2 weeks in one of the best rentals since the family has been vacationing in South/North Carolina! It was a very comfortable unit: clean and updated kitchen appliances. I would highly recommend for a family of 4 to 6 guests. The location of the property is amazing and the rental company provided excellent customer service. While overall the property was clean, we did encounter a few cleanliness issues (but I am a super neat freak)! The wife and I decided to get away for a few days, couldn't have asked for more, Amazing views, property manager was very helpful, It was clean, pools were nice. Will definitely be coming back soon! It was overall a good experience. The staff was excellent. There were dead bugs under the bathroom floor mat, but just one. There needed to be more seating in the condo and the outdoor furniture was marginal at best. Thank you for your review and we are glad you had a good experience, we will relay your suggestions to the owner. Bryant Real Estate was great to work with. They are conveniently located for key pickup/drop off. The app they offer was very helpful too. I would definitely rent another property from them. The location of the unit was very good. We enjoyed the beach and the nearby pool everyday. As far as the unit is concerned it needs some serious updating. Lots of dishes in the kitchen but lacked some basic utensils. The outside furniture needs to be replaced. Very worn out. We experienced numerous spiders as well. We are glad that you had a nice vacation and appreciate your feedback and concerns about updating. We will relay this to our housekeeping department to stock more utensils and look into replacing the outdoor furniture. We hope to see you next year. We had a great time. The condo was spotless and very well set up. We will be back. Had a great time visiting with our son that lives in Wilmington while enjoying the condo and beach. We stayed the week of 8/30 to 9/5/15. The proximity to the beach was wonderful. It was very quiet and we enjoyed the stay very much. The pools, especially the indoor pool was wonderful. The Townhouse could be updated, but it was clean and nice. The place is just like what the picture says.There are pros and cons about staying in this property.We liked that its beach front and has access to an indoor pool.The inside is a lil outdated esp the bathrooms but its still adequate.the only carpeted area inside are the stairs.when we arrived the floors seem sandy like no one vacuumed and theres a dead cockroach.we cleaned it up and then it was ok again.its nice to hear the ocean when you wake up.but the balcony door upstairs was terribly hard to open and we just left it close.Would be nice to open it though. The flush upstairs was a lil hard to flush at first too.And we had to bring our own sheets and pillowcases too otherwise its extra pay.all in all we still had a great time.the place served its purpose and we still had fun. Glad we could help!! Hope you'll visit again soon! Kelly- Great to hear to it!